Ski jumping is poetry in motion. All those twists and turns and spins are just awesome to watch and beautiful to contemplate, but they don’t really translate to still photographs in the way artist Greg Maino wanted to capture. 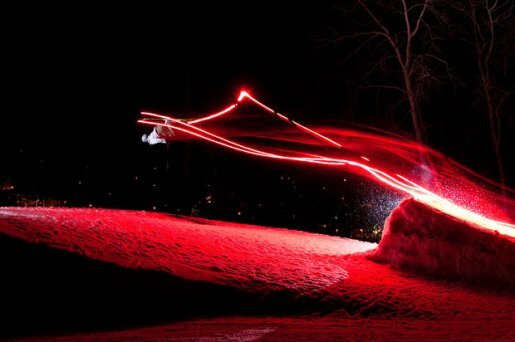 However, Greg had an idea to attach lights to the skis to capture the motion of ski jumpers in time-lapse photographs. So he recruited skiiers Craig Kilpela, Kurt Aho, and Mark Kivisto, bought a box full of road flares, rigged up a few head lamps, and presto, Olympic-style art! The flare-tracked ski jumps are incredibly beautiful, so make sure you check out the full set at the Telegraph, and make sure you head over to Greg’s official website to check out the rest of his portfolio. It’s like something out of Koyaanisqatsi!